We have had so much rain that it hasn't been easy for us to get outside. The boys I watch are rough little guys and they are always sliding and tumbling in the yard. It is not easy to keep them clean on a good day. With all the moisture in the ground it is nearly impossible. That means that I have needed to find some things to do inside. We made these shirts last week just in time for the 4th. It was inspired by a pin on Pinterest. I love how they turned out! I awoke to a wonderful Monday morning. The sky is blue, the clouds are fluffy, the sun is shinning, birds are sings and there is a gentle breeze. The littles and I made a quick trip to the grocery store early this morning. I like to get out when the traffic is light and the store isn't full of crazy. Just a quick trip for fresh fruit, milk, lunchmeat and such. Then Megan was dropped off at my parents. She has plans to go swim with her cousins. 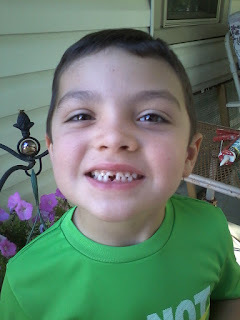 While we were there Abe lost his first tooth! I so wanted him to lose it while at home, but it wasn't meant to be. While they played I sat on the back porch soaking in the beauty and listening to a sermon. Although we were at church yesterday we missed the sermon as we were serving in the childrens department. After a wonderful morning it was time to get busy. We ventured inside for lunch. While the boys rested I worked on some task. When the boys were finished resting we joined Megan at the pool. We returned home and soon after the boys headed home for the day. Megan and I picked up, walked through the garden and waited for Chuck to return home. When dinner was complete it was time to make another trip to the hardware store. We are now in the drywall phrase of the garage. Woot! Woot! Flowers were watered and Megan played in the yard for a little bit. Then it was time to head in for the night. Once everyone settled in for a little bit it was time to gather for devotions and then to read from our chapter book. As I was sitting on the porch after a full day all I could think is that life is really, really good. Not perfect by any means, but I am thankful that there is enough joy to make life enjoyable. Chuck returned to work this morning. He was off a week, then worked a week, and then was off again last week. Our garage project is coming along slowly, but surely. We were out and about more then normal with trips to the hardware store. I admit that lead to us eating out more then normal for the week. Project or no project is time to reign in the spending and get back at our normal, frugal, way of living. It has been very warm here. That means that turning on the oven is not a good thing. As we all know that adds extra heat to our homes. I had some bananas that needed had to be used. I mixed up the dry ingredients and got everything ready the night before. That way it could go in the oven first thing in the morning. While I was puttering around in the kitchen I threw some oatmeal in the crock pot. A healthy, low cost breakfast was waiting when the little were ready to eat. I also completed my menu for the week. Most of the things on my menu can be prepared on the grill. I love making meals on the grill! The to do list is ready so I can get things done! There is something about making items off a list that keeps me motivated. A long over due thank you note was slipped in the mail. A sweet friend mailed me a surprise package. Now that makes you feel loved and appreciated! Now it is time for me to go and get some things marked off my list! As I was slicing watermelon I was thinking of our dear neighbor Bill. He was close to 80 when we moved in and he was quite the character. He went to glory severval years ago and left a huge impact on us. He enjoyed sitting out on his back porch. If you caught him at the right moment he would tell us stories of years past. One of the stories he told was about his childhood during the Great Depression. His family left Indiana to visit family in Kansas. He said that the entire time they were there all they ate was watermelon and fried chicken. He said that they would pick the melon straight from the field and dig in. As a little boy he thought it was the greatest thing ever! He didn't realize until he was much older that they ate watermelon and fried chicken because that is all there was. It is hard for me imagine times being so hard that you eat the same thing over and over for days and days. As a little boys it was a great adventure for Bill. He had all he needed; a full belly and the love and security of family. It serves as another example of how the simple things really are the things that matter. Summer is in full swing around here. These three crazy, loving, active little ones keep me hopping. I have been working on a project which resulted in my counter looking like this. It was driving my crazy while I painted another cabinet. Thankfully it is now complete and everything is back in its place. Besides my project and the everyday stuff there has been fun. The pool is open at my parents and Megan is spending a big portion of her day there. The boys and I usually stop by for a dip after nap time. The minion goggles crack me up! Using wax paper was a must as it was a little stickier after sitting for a moment. The big thing happening around here is ripping out the garage. The ceiling in the garage had been sagging. Once Chuck ripped it out he found the cause. The person who installed the pull down ladder to the attic cut the support beam to put it in. Chuck was not happy especially when he saw that if they had moved the stair over four inches they wouldn't have needed to cut the support beam. This is going to be an expensive, time consuming project. Thankfully we have been saving for this for a while. Notice the extra place setting? That has been the new norm as Chuck's dad has been helping with the garage. His only request is that I feed him. I think I can handle that! The boys will be on vacation again next week as their mom is taking a week break between jobs. The unexpected week off caused Chuck to change his vacation. He changed a later vacation week to this so we would have another week together without the boys. I told him I am looking for tons of progress in the garage! ;) He laughed and said he is also.